Call: North Clubhouse: (813) 436-2182. 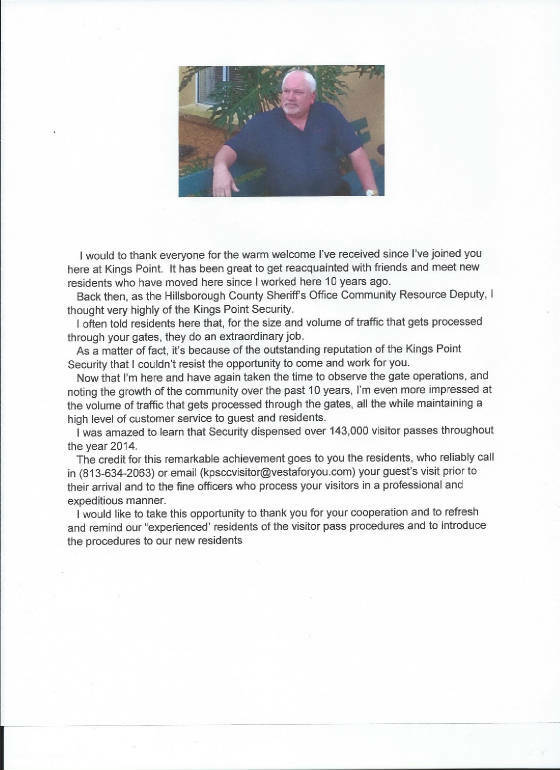 Gloucester A, Is proud to welcome, Former, Hillsborough County Sheriff's Office Community Resource Deputy Joe Bert. Joe is now our new, "Kings Point Security Chief." As you can see below, Our New Chief is as glad as we are to be Our new K.P. Security Chief! TO increase image size: Click Image. This condominium association does not allow pets to be harbored in the unit or to be on the association's property. Vistors, lessees or guests may not have pets in the unit or on the association's property. Bringing a pet into a pet-free condominium may result in a fine and removal of the pet(s), in accordance with condominium governing documents. 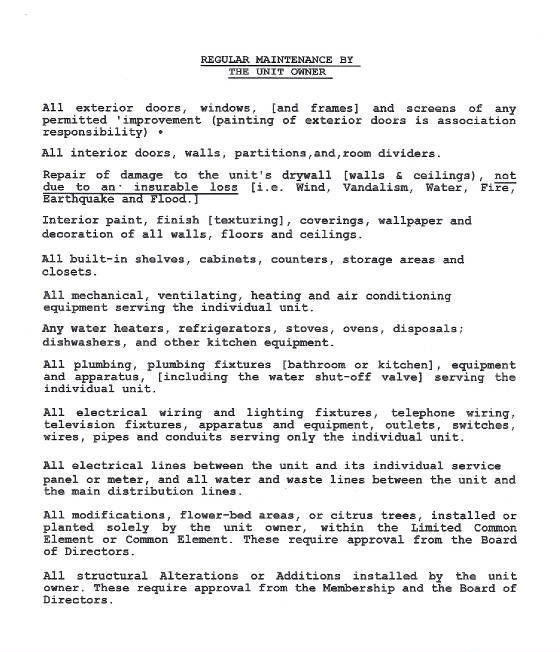 Unit Owners must acknowledge that all exterior alterations or improvements done by any previous owner are their responsibility to maintain, repair and insure at their expense. This includes, but is not limited to; concrete slabs, enclosed or screened lanais, bushes or trees. If a concrete slab was poured over existing irrigation lines, homeowner will bear the expense of moving such line should it break. 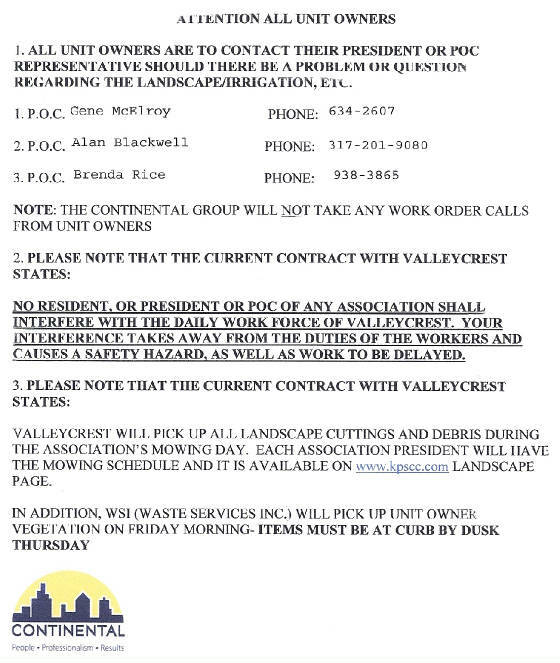 Owners may view their file or request copies of any prior Allteration or Improvement by calling The Continental Group at 642-8990. Unit Owners are responsible for reading and becoming familiar with the restrictions, rules and regulations of our condominium association. GENERAL INFORMATION: Under the ADA: Certain disabled unit owners, with a Doctor's Specific professional diagnosis, are allowed to have a Service, Companion or Therapy Animal will refer to singular (1) or plural (2) animal(s). Any change of Animal will require a new Agreement to be executed. 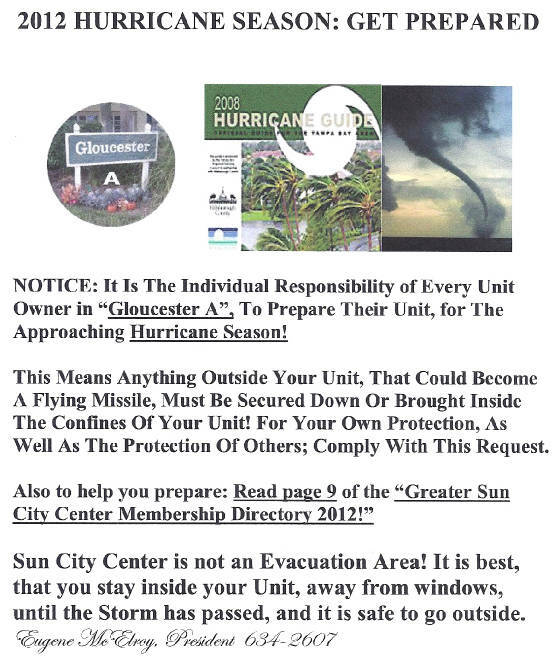 OF GLOUCESTER A CONDOMINIUM ASSOCIATION, INC., SUN CITY CENTER, FLORIDA 33573. Identification of Service animal: ( ) dog or ( ) cat currently being kept at the above location. 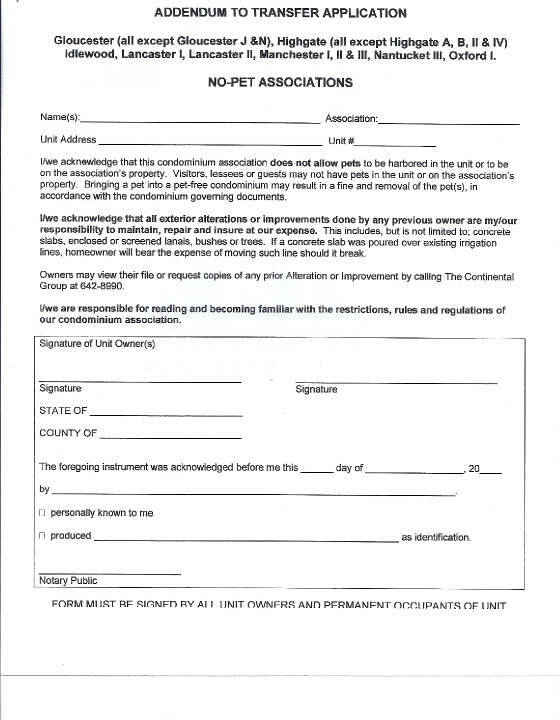 This Service, Companion or Therapy Animal Agreement is entered into by and between the above-identified condominium unit owner(s) (hereinafter called "Owner") and The Continental Group, as the Management Firm and as agent on behalf of the condominium association for the above-identified condominium (hereinafter called "Manager"). Service, Companion or Theraphy Animal will refer to singular (1) or plural (2) animal(2) animal(s). Any change of Animal will require a new Agreement to be executed. 1. 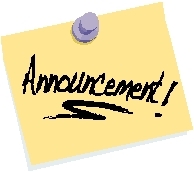 Manager shall enforce this Service, Companion or Therapy Animal Agreement pursuant to the terms hereof, and the decision of Manager to charge a penalty fine or to make a decision to repair damage shall be in the sole discretion of Manager and shall be final. If it should become necessary for Manager to utilize the services of an attorney for appropriate action to enforce any provision of this Service, Companion or Therapy Animal Agreement, Owner agrees to pay all costs and expenses reasonably incurred including but not limited to, attorneys' fees and costs of demand or litigation associated therewith. Owner agrees to pay all costs upon demand. In consideration for being permitted to keep a Service, Companion or Therapy Animal(s) in accordance with the foregoing provisions, Owner specifically agrees to indemnify and hold harmless the Manager from and against any and all manner of actions, causes of action, law suits, debts, claims, damages, judgments and any other liability or matter arising in law or in equity directly or indirectly as a result of this agreement or the keeping of the Service, Companion or Therapy Animal in the unit, the property of the condominium and the Kings Point complex. a. A Service, Companion or Therapy Animal shall not be permitted to defecate or urinate on any area defined as a common element, limated common element or other properties at Kings Point except within the designated areas. b. A Service , Companion or Therapy Animal shall be kept on a leash at all times when such Animal is outside of Owner's unit. d. A Service, Companion or Therapy Animal shall not be permitted to cause damage or destruction to any unit or to cause damage or destruction to any of the common elements, limited common elements or properties in the Kings Point complex. 3. Any complaints of damage caused by the Animal from other unit owners shall be submitted to the Manager in writing and shall be verified by the Manager's employees or Kings Point guards. Any employee of the Manager and/or a Kings Point guard may also file written damage complaints. 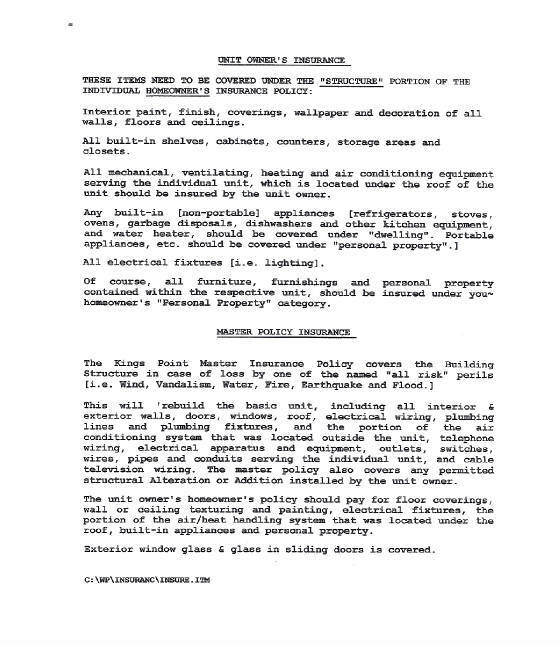 Manager shall determine the amount of damage and notify Owner in writing to make the necessary repair or replacement. 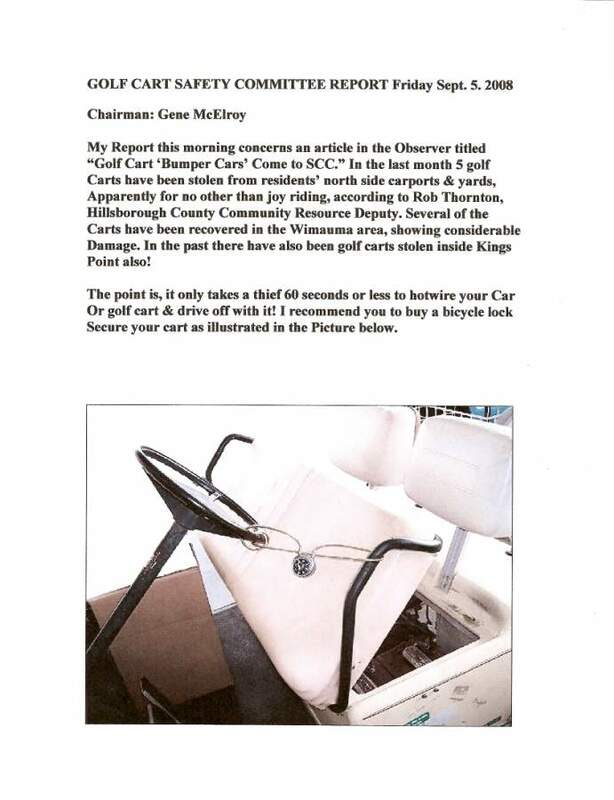 Owner will pay amount of damages within fifteen (15) days from the date of such notice. Payment for damages pursuant hereto shall not be in lieu of any right of action which the person sustaining the damage shall be entitled to independently. 4. 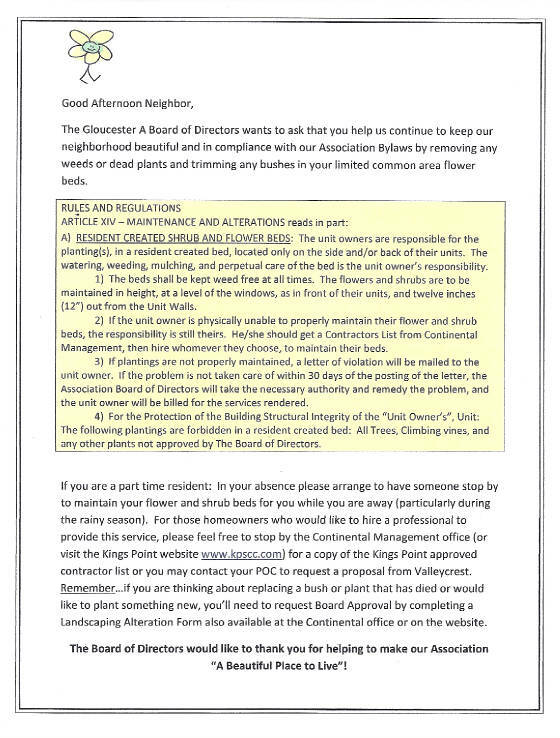 Complaints not involving damages submitted to the Manager by other unit owners at Kings Point shall be in writing and shall be verified by Manager. Such complaints may also be submitted in writing by Managers employees or Kings Point guards. a. 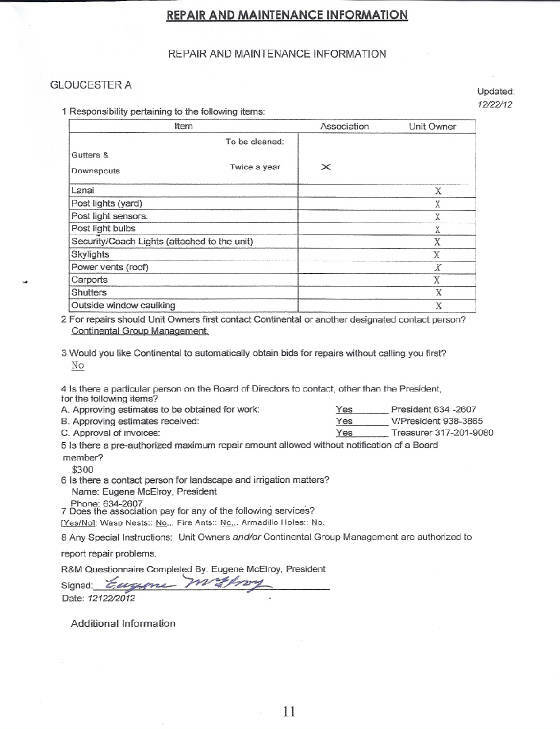 First infraction: Manager shall notify Owner of infraction in writing. b. Second infraction: Manager shall notify Owner in writing warning that the next infraction will cause a penalty fine to be assessed. 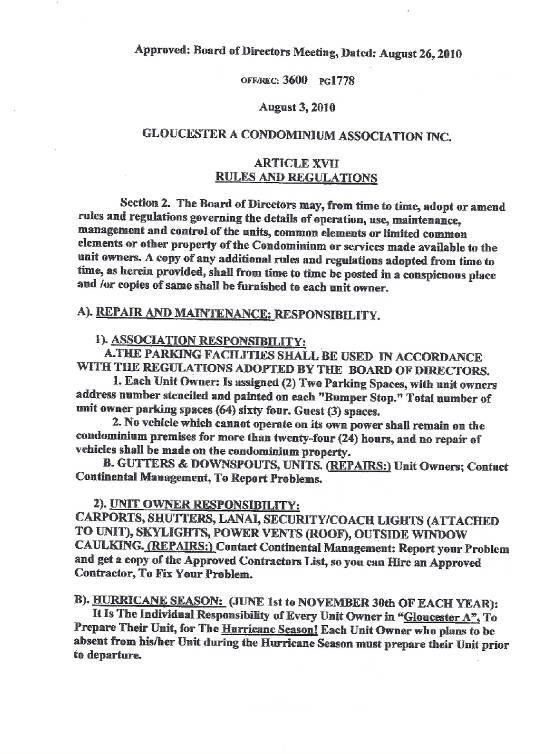 c. Third infraction: Manager shall notify Qwner and assess an amount up to the maximum allowed under the applicable provisions of Section 718.303, Florida Statutes, as a penalty fine which Owner shall forfeit and not be entitled to recover. However, such fine shall not be levied until Qwner has received written notice of the infraction in accordance with Section XIX (H) of the Declaration of Condominium for the Owners condominium. Such notice shall give Owner the opportunity to request a hearing before a committee of Owner's, created pursuant to Florida law, at a time and date which shall not be more than thirty (30) days after the date of such notice. 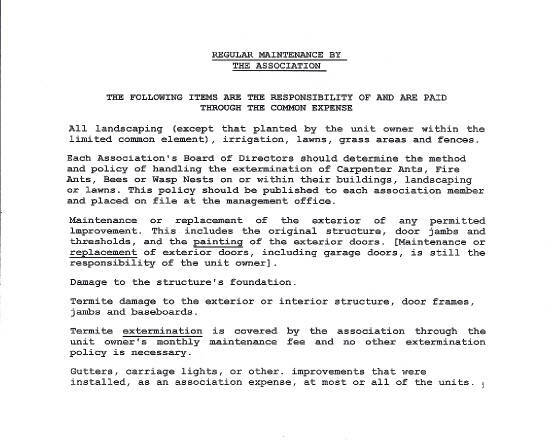 d. Fourth infraction: Manager shall notify Owner that this Agreement is terminated and shall demand that the Animal, as applicable be removed from the premises within thirty (30) days from notice. Prior to taking the action contemplated in this subparagraph, Owner shall have the same opportunity for notice and a hearing as provided in subparagraph (c) above. Infractions for purposes of this paragraph shall cumulate only on the basis of separate twelve (12) month periods with each new period commencing on the annual anniversary date of this Agreement ("Infraction Period"). In other words, the number of infractions in any Infraction Period shall not be carried forward into the next Infraction Period for purposes of the enforcement of this paragraph. 6. This Service, Companion or Therapy Animal Agreement shall be executed in duplicate copies and Owner's copy shall constitute the permit for the keeping and harboring of the Animal until the same shall be terminated by Manager in accordance with the terms hereof or terminated upon the death of the Animal or removal of the Animal from the Owner's unit. 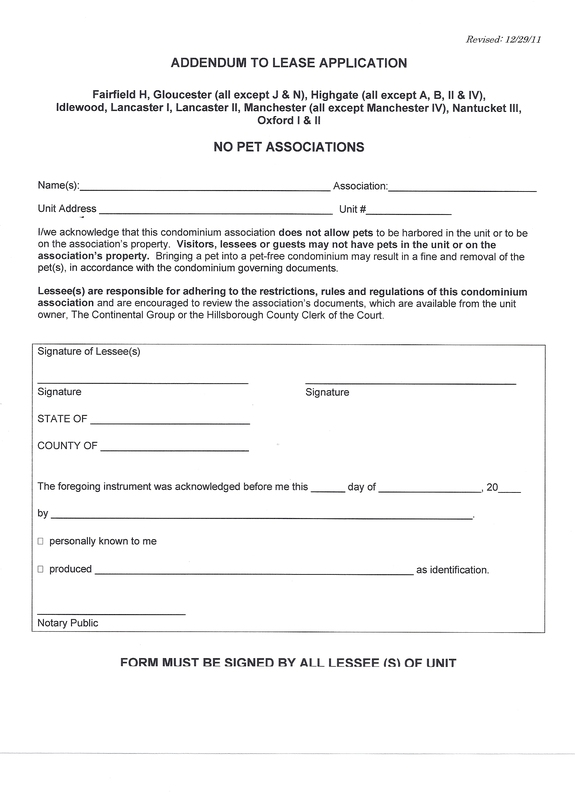 This Service, Companion or Therapy Animal Agreement and the permit it represents is not assignable by the Owner. Owner Agrees to abide by all state and local animal ordinances. 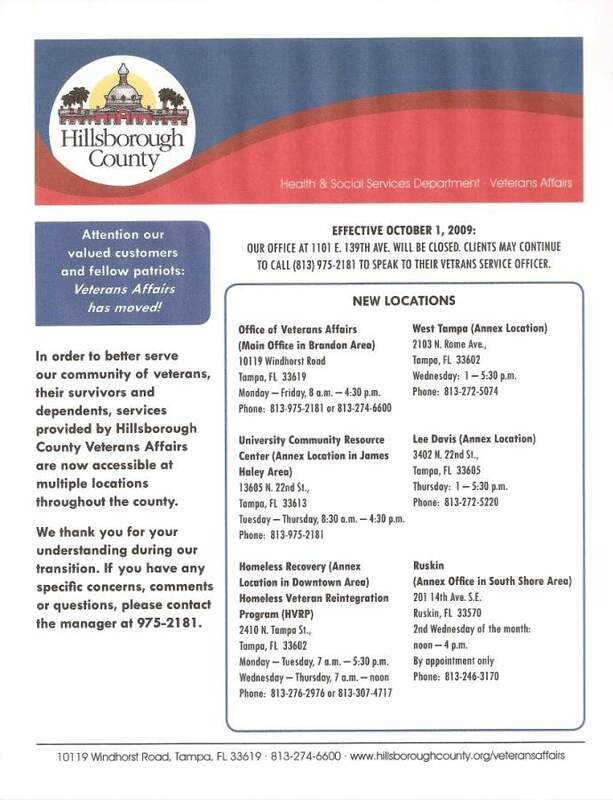 An overview of Hillsborough County Ordinancies is attached. 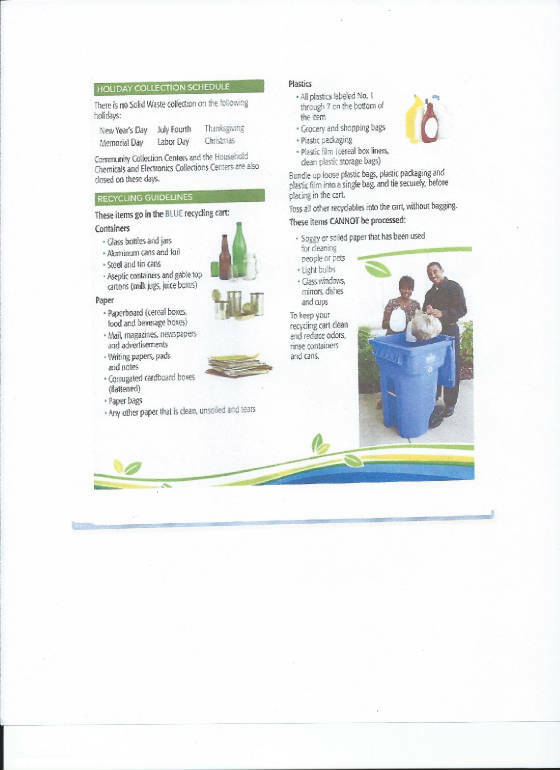 The complete statute is availablethrough Hillsborough County Animal Services. The Agreement may not be altered or changed in any way. Animal Services-Hillsborough County. * All dogs, cats, and ferrets four months of age or older must be vaccinated against rabies by a veterinarian and be registered with the department. This provision provides for local enforcement of state law which now requires ferrets to be vaccinated against rabies. * All dogs will be required to wear the rabies tag when outside. Cats, when outside, will be required to wear the tag or to be micro chipped, or have an ear tag that can be used to identify the cat so the owner can be traced. Dogs and cats while participating in a sanctioned event, will not be required to wear the tag. This provision will better enable a person bitten by a dog or cat and public health authorities to know if the animal has a current rabies vaccination. This will also aid in getting lost pets and their owners reunited. *Excluding public right-of-way on an owner's private property, no dog or cat shall be allowed to stray, run or go, at large upon any public property or street, sidewalk, park, or on the private prooerty of another without the consent of the property owner. Any cat routinely outdoors while not under direct control must be sterilized. This will better protect the private property rights of our citizens who do not want dogs or cats on their property. It will help reduce problems that can result from outdoor pet cats indiscriminately breeding. It will also likely result in, over time, a higher percentage of pet cats being kept indoors; thereby reducing the health and safety risks to which outdoor cats are exposed. * Dogs or cats in heat, when not in proper enclosure, must be under the direct supervision of a responsible individual so that the dog or cat is not allowed to unintentionally come into contact with a male dog or cat and breed. This provision will help prevent unwanted litters of puppies and kittens that contribute to our tragic dog and cat overpopulation problem. * Any feces deposited by a dog, cat, or pet pig on public property, public walks, and recreation areas or the private property of others must immediately removed by the person who has custody or control of the animal. This provision will help reduce the health and nuisance problem created by dogs and cats that have been permitted to defecate on the property of others. * No person will transport on any public highway, roadway or thoroughfare any animal in a vehicle unless the animal is safely confined or tethered to prevent the animal from falling or jumping from the vehicle. This provision will reduce the potential danger to people and animals that could be caused if an animal were to fall onto a busy public road in our county. * It will be unlawful to strike or interfere with a service animal while performing its duties. This will help prevent someone from interfering with a service animal that is assisting, for example, a deaf or visually impaired person. The owner of any dog that bites any person is on or in a public place, or lawfully on or in a private place, including the property of the owner of the dog, is liable for damages suffered by persons bitten, regardless of the former viciousness of the dog or the owner's knowledge of such viciousness. However, any negligence on the part of the person bitten that is a proximate cause of the biting incident reduces the liability of the owner of the dog by the percentage that the bitten person's negligence contributed to the biting incident. A person is lawfully upon private property of such owner within the meaning of this act when the person is on such property in the performance of any duty imposed upon him or her by the laws of this state or by the laws or postal regulations of the United States, or when the personis on such property upon invitation, expressed or implied, of the owner. 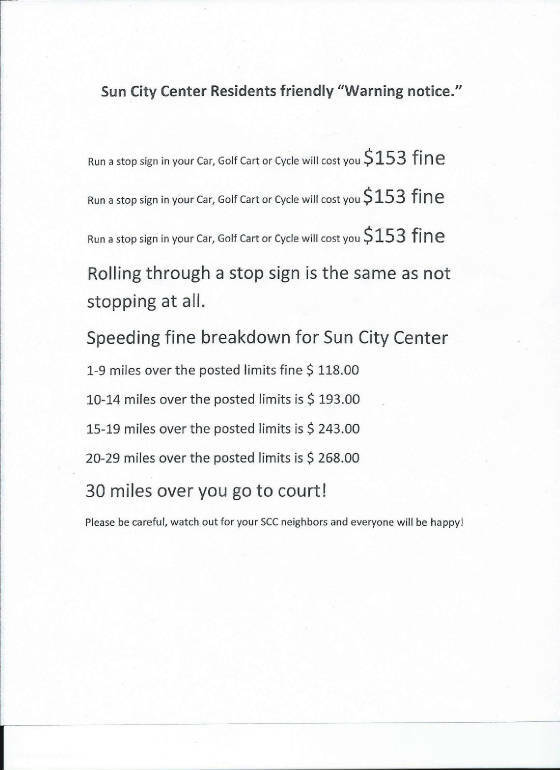 However, the owner is not liable, except as to a person under the age of 6, or unless the damages are proximately caused by a negligent act or omission of the owner, if at the time of any such injury the owner had displayed in a prominent place on his or her premises a sign easily readable including the words "Bad Dog." 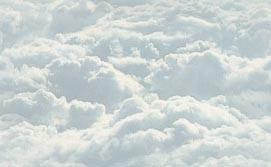 The remedy provided by this section is in addition to and cumulativr with any other remedy provided by statute or common law. IN WITNESS WHEREOF, the undersigned executed this Service Animal Agreement on this_________day of____________________. The foregoing insstrument was acknowledged before me this________. day of___________________. 20_______.by_______________________. He/She ( ). is personally known to me or ( ) has produced______________________________. as identification. Print Name , Title and Date___________________________. See which of your neighbors are selling their Home. Maybe you know someone, who may be interested! Click Here and find out! Click Here to Access: Health Care Advance Directives! 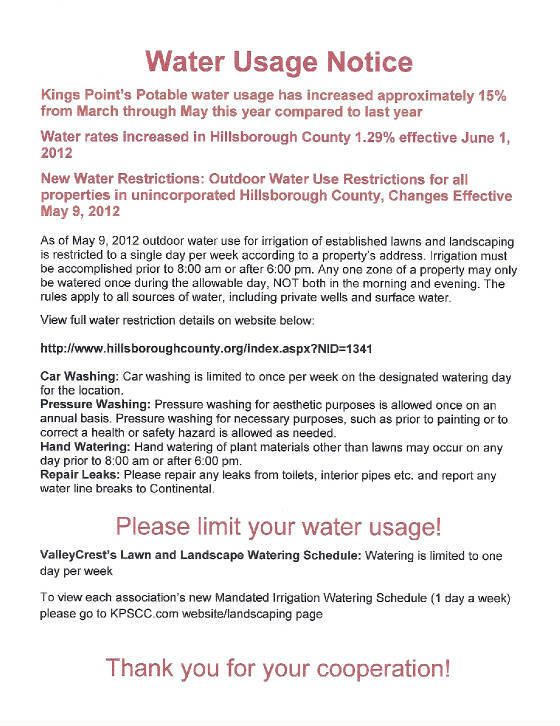 Kings Point Residents Committed Bright House Number: (813) 436-2182! . Watch for the next "Operation Medicine Cabinet." 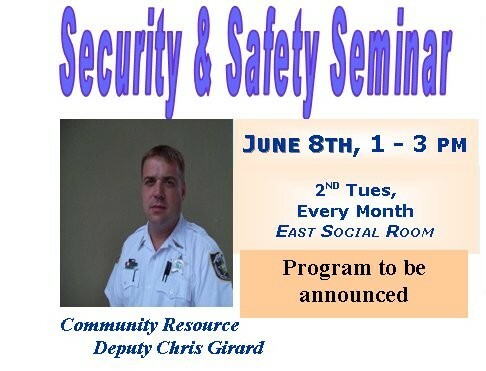 Next Safety & Security Seminar! 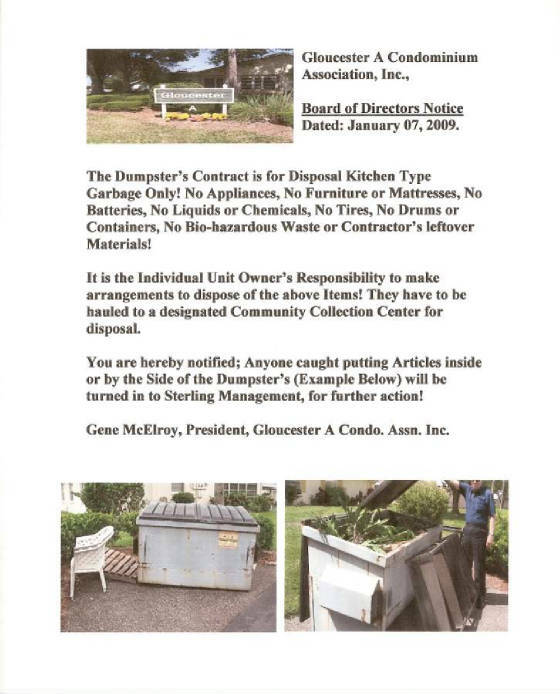 Gene McElroy, President, Gloucester A. We are getting ready for "The 2012 Hurricane Season"! 1. All Gutters & Downspouts have been cleaned. 2. 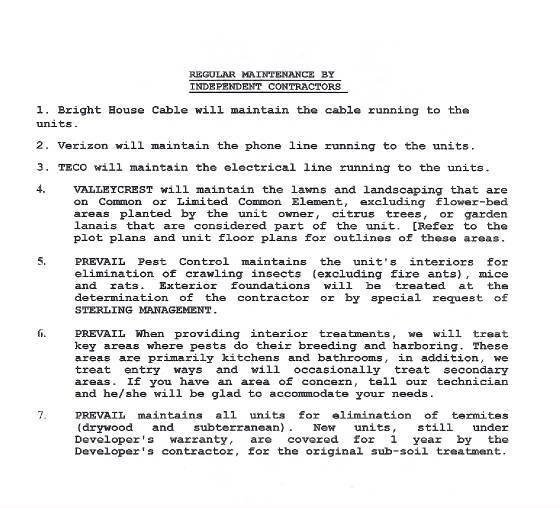 All Gutters were Inspected, and if Maintenance was required; it was done, shortly after the gutters were cleaned. 3. So, If you heard noise on your roof, it was the repairman doing this work! Thank you, for your patience, while this work was being done! The Gutters & Downspouts were cleaned, and New Gutter Screws were installed, in order improve the holding integrity of the Gutters! 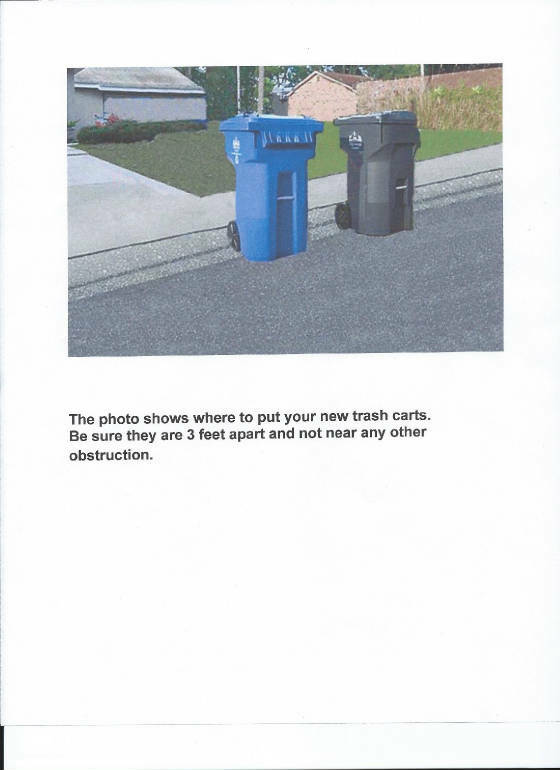 This work was completed, approximately 4:55 pm, on Wednesday 5/23/2012.